CareTeam enables better coordination of support for adults in their own homes. 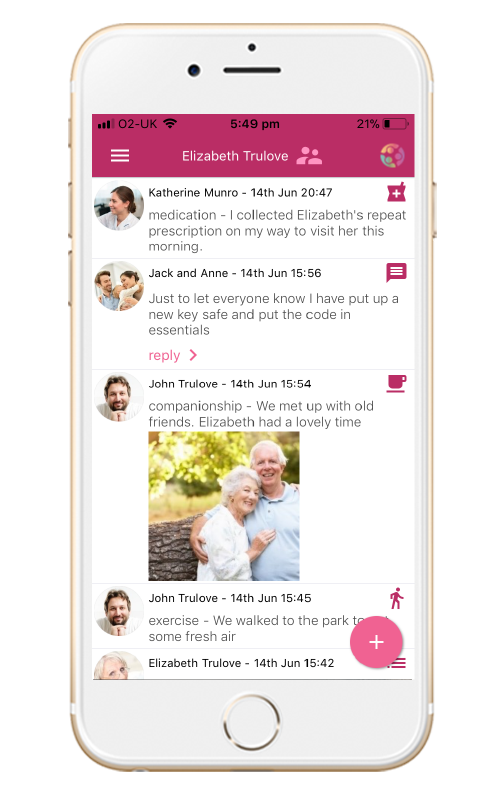 It is a secure network that can include anyone involved in the care of an adult at home such as family, friends paid for care provision and healthcare professionals. We are offering CareTeam free to our first 500 users. Sign up now to secure yours. 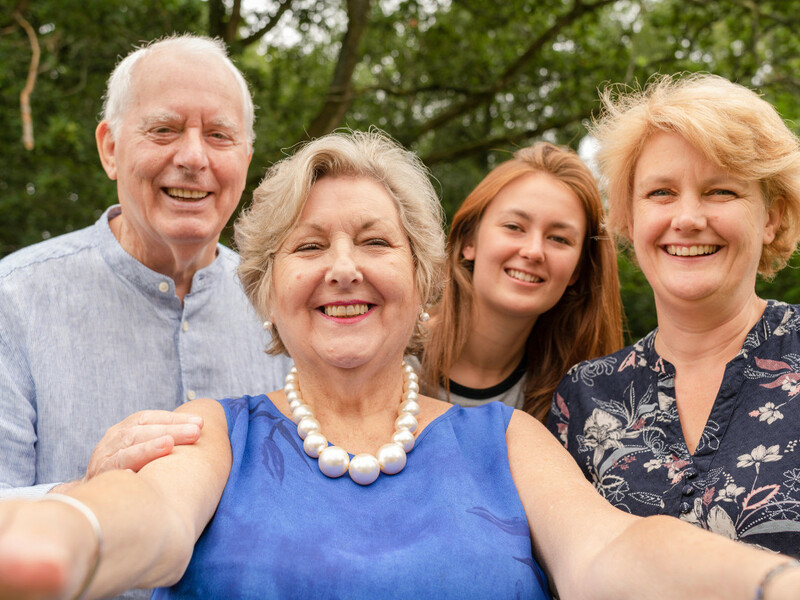 The support from friends, family and neighbours is often vital for adults living at home but can be overlooked by ‘formal’ care arrangements. The CareTeam app has been designed to integrate this help and includes features required by adults with increasing care and support needs. 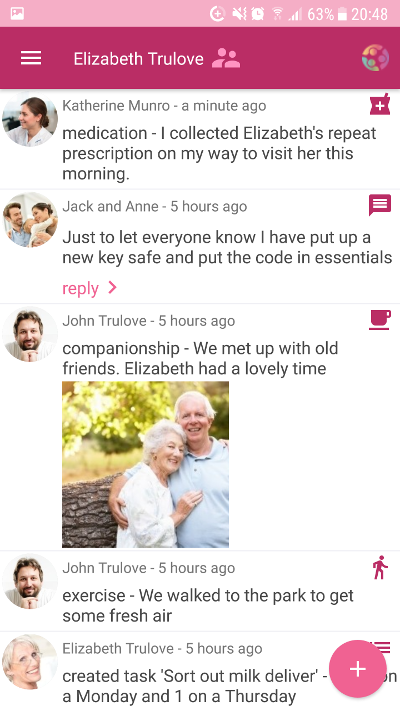 It’s easy to use, enabling an invited circle of trusted people to share important information such as medications, tasks and appointments in a secure platform. CareTeam uses an innovative security and privacy system that keeps you in control of your personal data. CareTeam integrates with telecare and passive sensors from a range of suppliers. 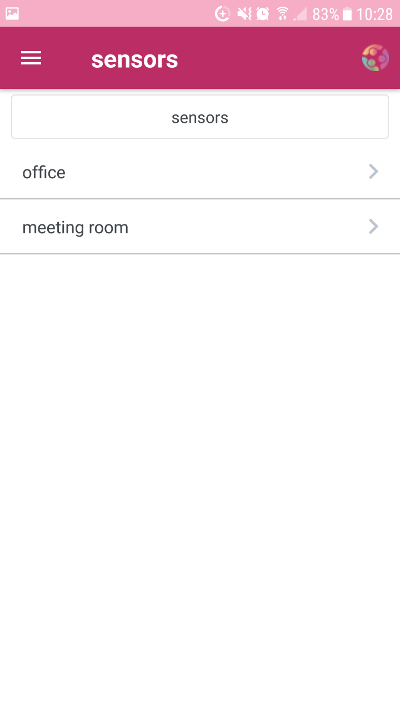 The CareTeam app has been designed to be easy to use, to save time and improve the life of all involved in the care. You own any information added to your account and can choose who to invite to share this information and help with care. The system also uses analytics to gain insights on patterns in care and behaviour, these can be used to plan future care needs. With CareTeam anyone can be invited, including friends, family and professionals, allowing better teamwork and improved outcomes. 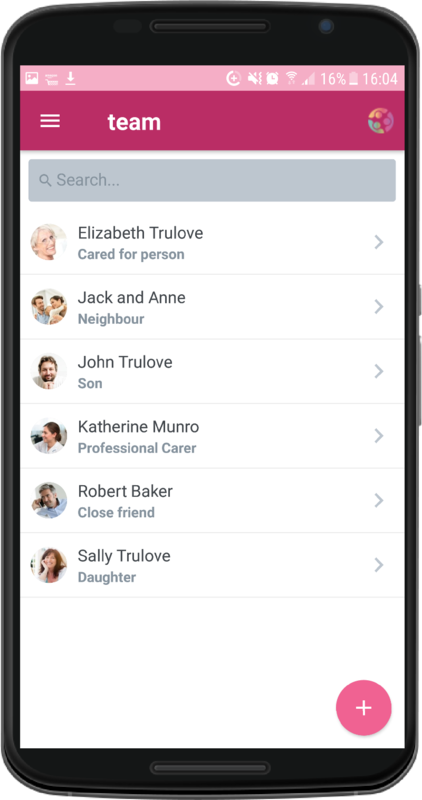 The app home screen provides an at a glance summary of the care your loved one is receiving. 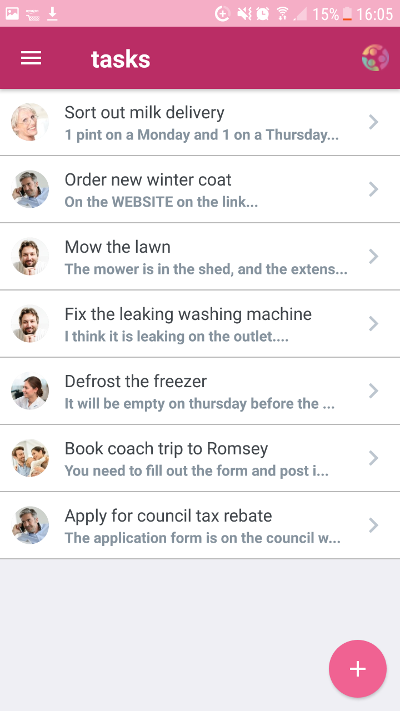 Here, updates made by all carers as well as new tasks, essentials and calendar events are all brought together in one place. 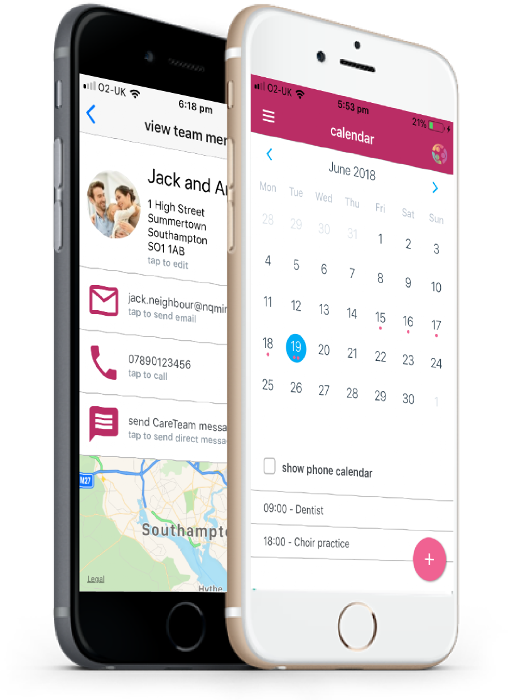 CareTeam also acts as an address book allowing you to keep track of important contacts and communicate with others in the care team. Carers share a calendar which allows them to see upcoming appointments and work together to get things done. Carers can create events and request others to attend or help. 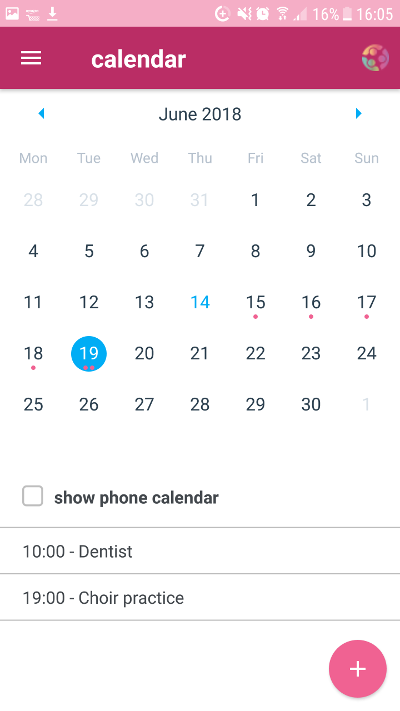 There is also a privacy conscious option to integrate with the phone calendar so you can coordinate caring with other areas of your life. CareTeam allows you to easily store important and useful information such as medication, access codes and financial details. These can them be shared with team members so information is readily available when it is needed. Carers can keep organised by creating and sharing information about what needs to be done. Carers can create a task then request help from others. It allows people to see at a glance what needs to be done and who is doing it. If you wish, discrete sensors can be placed in your home to provide comfort and reassurance to all involved. These can allow carers to check remotely and identify possible issues. 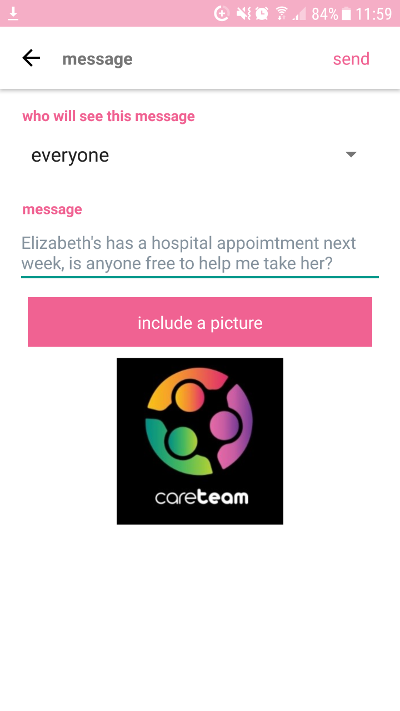 You can send messages to everyone in the CareTeam, or to specific people. These allow carers to keep up to date with what’s going up and share information. 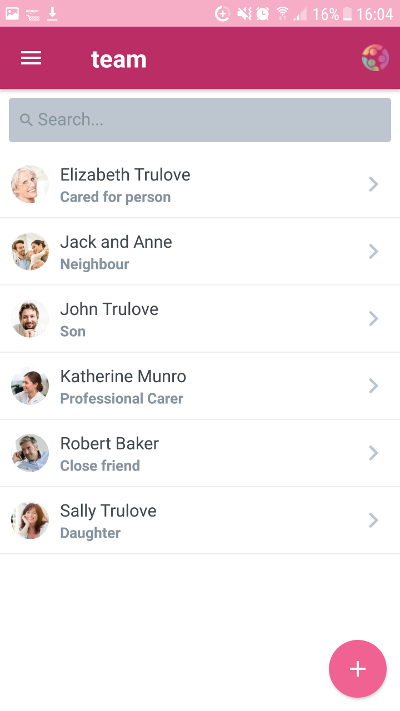 Carers can amend their profile to allow others to see only the information they want to share. 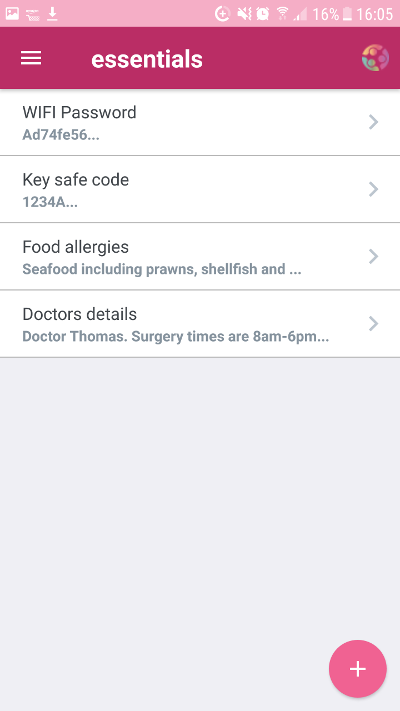 You can add notes about your availability or role to help coordinate care. Family and friends who help with day to day activities, or who live further afield and want to keep in touch. Professionals such as carers, cleaners and gardeners. Regular updates from visits can provide reassurance to loved ones and avoid duplication of tasks. 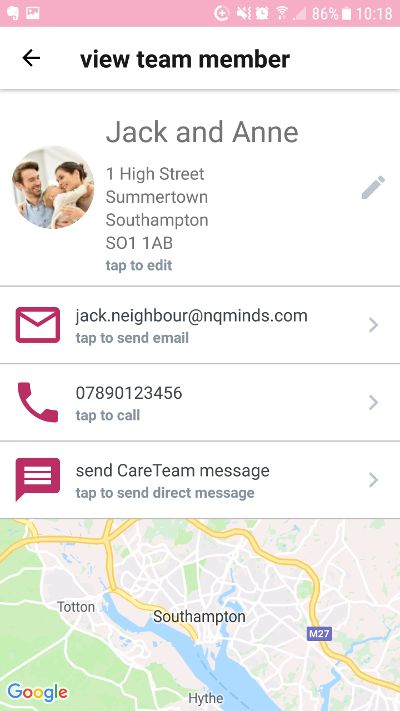 CareTeam is developed by nquiringminds ltd in collaboration with the University of Southampton and Southampton City Council.